Sorry, but the guitar group is booked up! You have the possibility to subscribe to a waiting list. In case of a cancellation you move to the the free seat. In the vocal group there are only few seats left. The Seventh Annual Workshop for Jazz Guitar and Vocals is coming! In April 2019 we are going to gather again on the stunning estate of Schloss Korb near Bolzano/South Tyrol to spend an amazing five days focusing on creating music. Every year we welcome new students, and those returning – many for the seventh time! Our seasoned trio of instructors are already preparing: singer songwriter Jeanne Gies from New York City for vocals and Helmut Nieberle and Paulo Morello from Regensburg/Germany for guitar. These three tutors have years of teaching and recording experience, and: they are known as stellar performers ‘live’ onstage! Every student, from beginners to the most advanced, benefit from their ‘first-hand’ knowledge of the art of live performance that these working musicians happily share. At this workshop we believe in taking care of both ‘body and soul.’ The Schloss owners Ruth and Fritz Dellago and their staff take care of us with love and devotion. The exquisite cuisine and the wine cellar cater to every desire to sweeten the days at the Schloss and to make us temporarily forget the rest of the world. You need not introduce Helmut Nieberle in Germany. 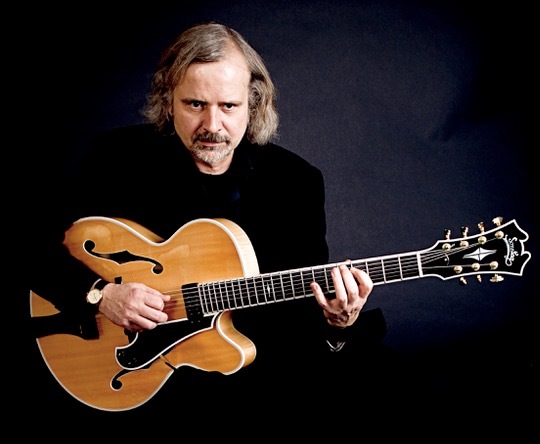 Since 2002 Helmut acts as tutor for the acclaimed workshop series of Sonntag Guitars. He has been successfully on the road with various ensembles for decades, and is well-known for his proficiency on the 7-string archtop. One glance at his website is enough to give you an impression of his worldwide fame. Paulo Morello has gained a superb reputation as one of the most versatile jazz guitarists in Europe. He is known for his Brazilian projects featuring Grammy winner Leny Andrade and the “Night of Jazz Guitars” featuring Larry Coryell. 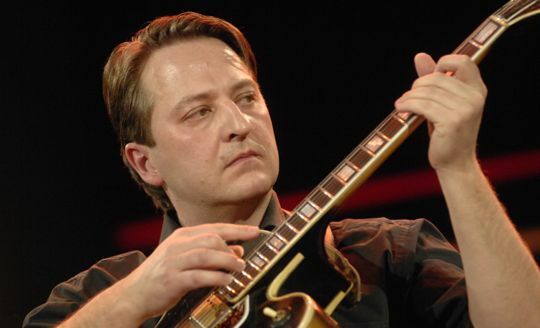 His unique and expressive style of playing reveals influences of many of the most influential guitarists in jazz like Joe Pass, Pat Martino and Mike Stern, among others. Paulo experienced his initiation to Hammond-trio playing as sideman of the legendary Johnny Smith, whom he accompanied on his last tour through Europe. He has toured with his own organ trio ‘Hammond Eggs’, featuring musicians like Randy Brecker and Bob Mintzer. He has worked with Paul Kuhn, Ivan Lins, Philip Catherine, Airto Moreira, Roberta Gambarini, André Ceccarelli and the Bamberger Symphonikern. Paulo has a professor’s chair for jazz guitar and Latin music at the Hochschule für Musik in Nuremberg. Acclaimed jazz singer songwriter Jeanne Gies conducts the vocal workshops. Her home base is NYC, where she has performed and recorded with many jazz greats including guitarists Howard Alden, Russell Malone, Romero Lubambo, Bucky Pizzarelli, and Jack Wilkins, bassist Gerald Cannon, saxophonist Sherman Irby, drummer Willie Jones III, and many others. A highly experienced vocalist lauded for her distinctive phrasing and riveting live performance, Jeanne's recent tours include Germany, Scotland, and England. She penned the lyrics for her most recent recording Window ‘da janela.’ Recorded in Brazil, Window features the music of prolific composer Manu Lafer. You can hear many of Jeanne’s recordings on Spotify. Jeanne’s versatility and functional teaching methods allows singers from every genre and all levels of proficiency to thrive in this workshop. All are provided a creative, non-judgmental environment to develop their vocal craft. Singers are encouraged to bring songs that they dream of singing; the workshop culminates in a concert where all are welcomed to perform. Jeanne also specializes in assisting non-native English speakers who strive for accent free performance, and those who have vocal issues due to anxiety or strain. In addition to group workshops, singers may sign up for private sessions. Individualized private lessons are also offered via skype prior to the workshop: contact jeannegies@gmail.com. The guitar workshop includes a segment on vocal accompaniment. Guitarists and singers meet in the beautiful surroundings of this stunning castle where they explore creative ways to work together and discover new musical experiences. All of the tutors specialize in the art of the guitar/vocal duo and will focus on this intimate form of expression. During the lessons and nightly jam sessions, all students have the opportunity to perform with each other and the tutors to increase the mutual understanding of their individual instruments and the teamwork involved in this musical communication. The result: an unforgettable experience of growth and creative expression. The workshop will be conducted at the stylish and classy Schlosshotel Korb at Eppan near Bozen, owned and run by the family Dellago for generations. The hotel is situated on a marvelous position high above the Etsch river valley in the midst of vineyards which belong to the Family Dellago. The family runs its own winery there. As the name implies (‘Schloss’ means castle), one part of the hotel used to be an ancient castle dating back to the 13th century. In the course of the centuries various buildings were added. The rooms are lovingly and elegantly furnished, each one an individual expression of taste and style. The lessons will be held in three seminar rooms, which are exclusive to our use during the workshop days. With fair weather we have an option of studying outdoors on various terraces or parks. Hotel Korb offers pick up service from Bozen main station or airport for attendees who travel by public transportation. Choose your desired room category when registering. Rooms will be assigned in order of registration subject to availability. First course day: April 23rd, last course day April 27th. Daily lessons will take place from 10 a.m. to 1 p.m.
We will have two guitar groups, one with each tutor. Half way through the workshop the groups will exchange tutors. Jeanne Gies will conduct lessons in English. The last evening of the workshop (April 27th) will conclude with a concert featuring students and instructors: all are invited to take part! Students depart after breakfast and fond farewells on April 28th . . . Please don’t forget to bring a music stand and an amp if needed. There will be Sonntag guitars available for being tested. You will be entitled to attend the course only after receipt of your payment on the account mentioned above. Please contact Stefan at info@sonntag-guitars.com with payment questions. In case of student cancellation, until February 23rd, 2019 the complete course fee minus €30,- will be refunded. After February 23rd, 2019 there will be no refund. If the workshop is cancelled for any reason the course fee will be completely refunded. Every year, singers and guitarists experience a creative transformation at this unique workshop. Sieglinde Hahn, Singer, Stadtbergen in Bavaria, Germany, workshop participant for all six years – soon to be seventh!